Rebel Records has signed The Price Sisters to its roster of artists. 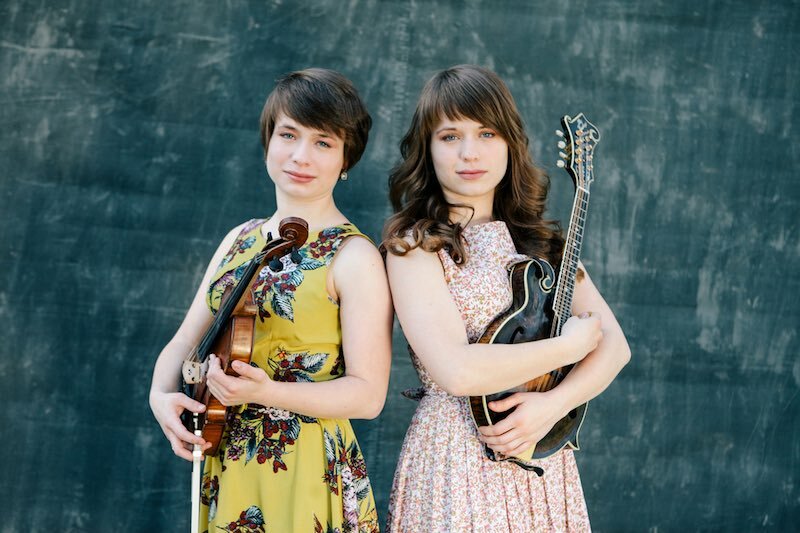 In a relatively short amount of time, these twin sisters – Lauren on mandolin and Leanna on fiddle – have generated an exciting buzz within the traditional music community for presenting their own, unique interpretation of the “ancient tones” created by Bill Monroe and his Blue Grass Boys. The Price Sisters’ ability to grasp the complexities of Bill Monroe’s music at such a young age has led to appearances at prestigious festivals such as Bean Blossom and Jerusalem Ridge (held in Monroe’s hometown of Rosine, Kentucky) and has earned them praise and respect from a few of Monroe’s ardent disciples, including Bobby Osborne, Byron Berline, Ronnie McCoury and Mike Compton (who recently selected Lauren, at just 21 years of age, to be one of the instructors at his prestigious Monroe Mandolin Camp this year). Rebel Records owner David Freeman, a huge Monroe fan himself, first saw The Price Sisters perform an impromptu jam on the Expo Hall floor at the 2014 IBMA World of Bluegrass convention in Raleigh and came away awestruck. There was a lot going on in the exhibition hall at the time, but I was drawn to the sounds of someone picking the fire out of Get Up John. Around a couple of turns I was thrilled and amazed to hear Leanna and Lauren Price playing and singing a bunch of Bill Monroe classics – as well as their own compositions – and not just ‘Uncle Pen‘ and ‘Blue Moon of Kentucky,’ but the hard stuff like ‘I Believed in You Darling,‘ ‘Blue Night‘ and ‘Sitting Alone in the Moonlight.‘ My initial feeling was that these girls were something special and deserved to be heard more. They come with high praise from some of the top musicians in bluegrass, and they are a great fit for our label. To find young musicians today who can not only play and sing beautifully, as Leanna and Lauren do, but also really appreciate the music they are playing, bodes very well for the future of the music that means so much to so many of us – David Freeman. The Price Sisters have performed at festivals from Michigan to Georgia and Colorado to Maine. They have also been guest performers on RFD-TV’s ‘Cumberland Highlanders Show’ and have participated in live performances for PBS’s ‘Song of the Mountains,’ ‘WoodSongs Old-Time Radio Hour,’ WKYT-TV, Lexington, Kentucky, and the legendary ‘Wheeling Jamboree.’ They have graced the stage as guest performers with a number of national touring bands including The Lost & Found, Bobby Osborne & Rocky Top Express, The Spinney Brothers, Dale Ann Bradley and David Davis & The Warrior River Boys. They regularly perform at various shows and venues in Kentucky. While maintaining their “Price Sisters” performance schedule, Lauren and Leanna are currently enrolled in the Kentucky Centre for Traditional Music (KCTM) at Morehead State University, where they are both pursuing BA degrees in traditional music with a concentration in bluegrass, and business administration minors. They are active members of the University’s Mountain Music Ambassadors Bluegrass Ensemble, traveling regularly with that group. They were also recently part of a group of six KCTM students who represented the United States and MSU during a ten-day tour of The Peoples’ Republic of China in May, 2015 spreading the gospel of bluegrass.